14-3/8” STUDS COARSE at one end National Fine on the other. 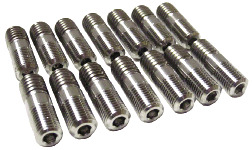 Special 6 Point Aircraft Nuts with a Small Head to fit those 2” Primaries. Really a great idea to save weight. No More Stripped Out Aluminum Heads Either.